WIN A SWEET PROGRESSIVE JACKPOT! Sweet Party at Fly Casino is for members with a real sweet-tooth for enormous progressive jackpots! 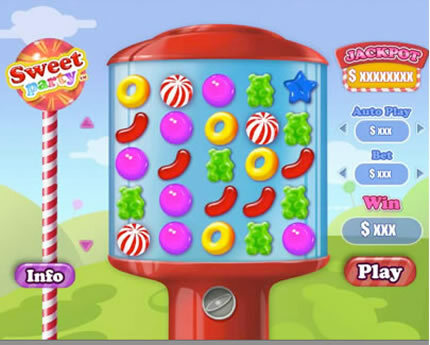 This new bubble gum style machine plays with fixed wagering options and is somewhat like Hot Gems. For every winning combination that you have, more symbols will appear to try and create additional winning combinations. Sweet Party at Fly Casino features five reels and five rows that make up 63 possible ways to win. All of the symbols are some type of candy including Gummy Bears, Peppermints, Jelly Beans and other sweet delights making up the different symbols. Go for a progressive this weekend! Saturday July 19, 2014 00:00GMT until 23:59GMT on your first deposit of $/£/€10 or more our members are eligible for our exciting Your Choice bonus. Super Value Monday! On Monday July 21, 2014 from 00:00GMT until 23:59 GMT, all members on their first deposit of $/£/€35 or more will receive a 129% bonus up to 129.00. On Tuesday July 22, 2014 from 00:00GMT until 23:59 GMT, all members on their first deposit of $/£/€30 or more will receive a 208% deposit bonus up to $/£/€150.00. You're Guaranteed Cash! Play at Fly Casino each Wednesday in July and you are GUARANTEED €/$/£ 5.00-200.00 cash prize from our random prize draw. You're guaranteed to win! To receive a cash prize, all you'll need to have is at least €/$/£500 in total wagers (any games) during your gaming day. It's that simple. Prizes issued on Thursdays.